It is estimated that the average American spends 55% (7.7 hours) of waking time in sedentary behaviors, such as sitting or working at a desk. Sitting is an unnatural posture and our bodies are really not designed for this. The effects of sitting all day are detrimental. According to the World Health Organization, about 3.2 million people die each year because they are not active enough. 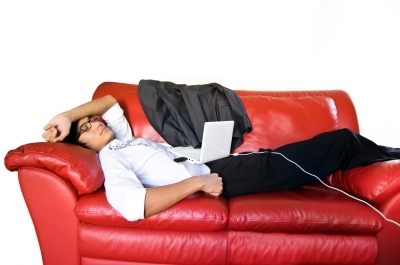 This makes physical inactivity the fourth leading risk factor of mortality worldwide (see http://medicalxpress.com/news/2015-01-deadlyeven.html). Right after sitting down, your calorie-burning rate slows down to about 1 calorie per minute (this is about one third of what you burn when you’re walking). In a meta-analysis published in January 2015 in the Annals of Internal Medicine, researchers found that sitting for prolonged periods is associated with chronic disease, such as cardiovascular disease, diabetes type II and cancer, and with early death. These effects are not counteracted by physical activity only. However, the effects were much more pronounced among those who do little or no exercise at all compared to those who participate in higher amounts of physical activity (see www.sciencedaily.com/releases/2015/01/150119171701.htm). For people who sit most of the day, their risk of heart attack is about the same as smoking, says Martha Grogan, cardiologist at the Mayo clinic. The Washington Post published an interesting graphic of what exactly goes wrong in our bodies when we’re sitting all day. Mentioned are organ damage, foggy brain, strained neck, sore shoulders and neck, inflexibility of the spine, muscle degeneration (tight hip flexors and mushy abs) and leg disorders. When watching television stand or exercise during the commercials. 2) Regular physical exercise, at least for 30-60 minutes every day. 4) Alternate your sitting positions and alternate between sitting and standing up. Try sitting on something wobbly like a gym ball or try using a standing desk. 5) Regular stretching for the neck and shoulders, hip flexors and iliopsoas, abdominals and lower back. Read this article for some good examples: http://greatist.com/fitness/stretches-desk-workers-today. 6) Try yoga poses to counteract the effects of sitting. For example these; www.huffingtonpost.com/2013/08/07/yoga-desk-job_n_3707818.html. Image courtesy of patrisyu, david castillo dominici and graur razvan ionut at freedigitalphotos.net.